Bob’s BMW Returns to Cuba! 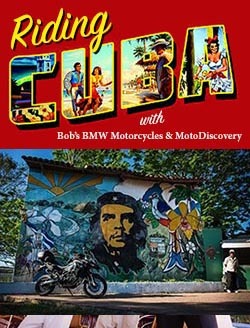 Bob’s BMW has partnered with MotoDiscovery to create an epic adventure on 2 wheels through Cuba, an exclusive opportunity to explore this incredible country. The dates are November 5-20, 2016. You will ride through the Cuban countryside, stopping along the way to meet natives and make friends, and learn about Cuban history. Bob’s 2015 Cuba tour sold out so you don’t want to wait too long to sign on. We’ll spend time exploring the excitement and vibrancy that Havana offers before hitting the road and visiting places you’ll remember for the rest of your life! We have extra space in a comfortable support van this time to take your significant other who may not ride at all or just wants to choose what days they do! Interested? Email Bob for complete details. Serious inquiries only please.